Learn about the history of the Russian Grand Prix, which has been held at the Sochi Autodrom since 2014. The sixth edition of the race is on September 26-29, 2019. It’s hard to believe that the upcoming Russian Grand Prix will be the sixth running of the event in the seaside city of Sochi, The race somehow still feels new still, even though it was over 30 years in the planning. Bernie Ecclestone had talks with Soviet leader Brezhnev about bringing F1 to the Russian capital after the 1980 Summer Olympics in Moscow. 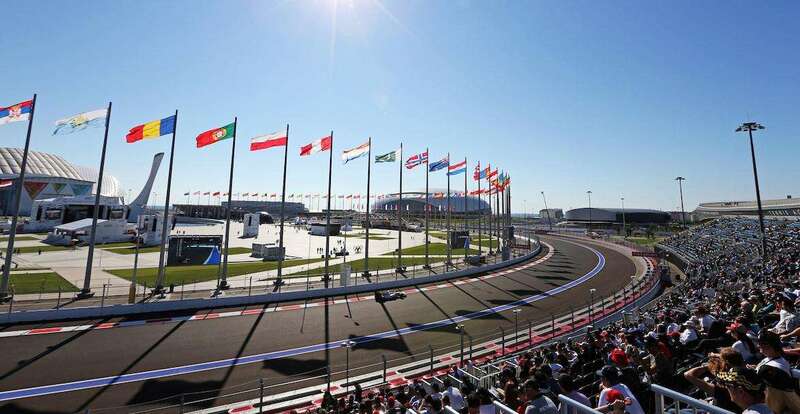 It would take another Russian Olympics – this time of the winter variety – to make the race a reality at the purpose-built Sochi Autodrom on October 12, 2014. The first race was held just eight months after Sochi staged the Winter Olympics and in the same Olympic Park precinct that hosted the indoor sports and opening/closing ceremonies. The initial seven-year contract for the race was bankrolled by the national government, with strong support from Vladimir Putin. With the event’s place on the calendar already confirmed until 2020, the promoter signed a 5-year contract extension in 2017 which will see the race held until at least 2025. Sadly, the Hermann Tilke-designed Sochi Autodrom has not been popular among fans or drivers due to the lack of overtaking opportunities and subsequent processional races held to date. It was recently reported that the Sochi owners are evaluating changes to the track to boost overtaking opportunities, with the smooth track surface a particular area of focus. Russian Grand Prix: Did You Know? Mercedes has won all five Russian Grands Prix to date. Lewis Hamilton has three wins, whilst Valtteri Bottas and Nico Rosberg have each won once. 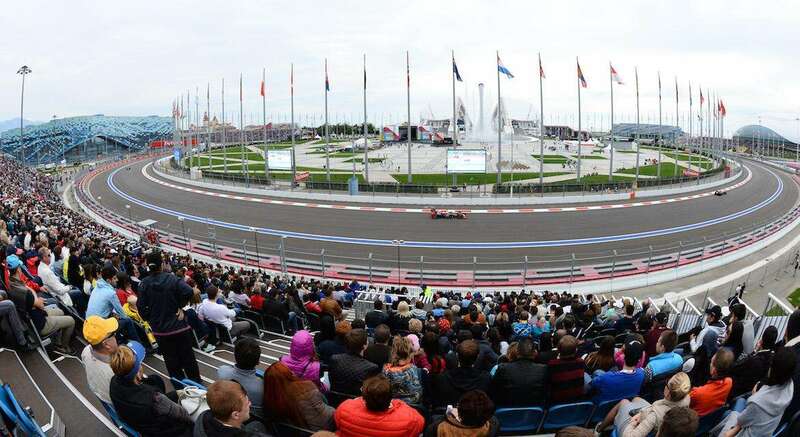 Ferrari are the only team other than Mercedes to have taken pole position at the Sochi Autodrom. Sebastian Vettel did so in 2017. There has been a Russian driver present at every running of the Russian Grand Prix so far. While Daniil Kvyat took part in all four races between 2014 and 2017, with a best finish of 5th in 2015, Sergey Sirotkin raced with Williams here in 2018. With Daniil Kvyat’s Toro Rosso comeback, there will once again be a Russian on the grid at the 2019 event. At 5.848km long, the Sochi circuit is the fourth longest on the current F1 calendar behind Spa Francorchamps, Baku and Silverstone. Around 30% of the circuit is used as public roads when racing is not taking place. Sochi is one of eight cities to have hosted the Olympics and a Formula 1 Grand Prix; the others are Melbourne, Montreal, Barcelona and Mexico City (all current F1 cities), plus historic venues in Berlin (AVUS), Los Angeles (Long Beach), and Rio de Janeiro (Jacarepaqua). 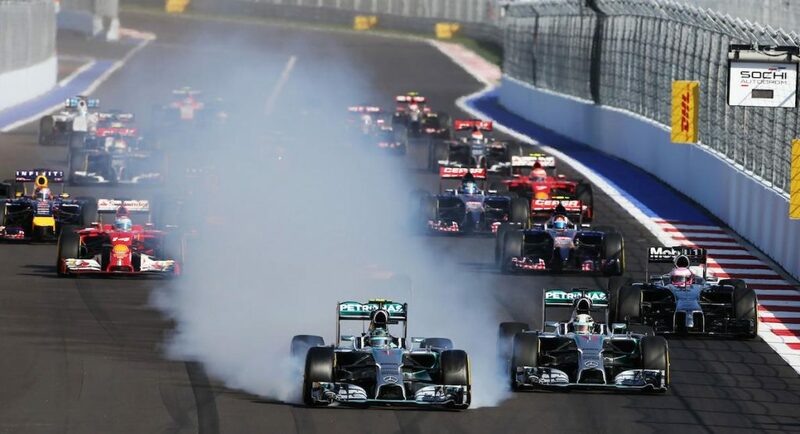 Drivers starting from second and fourth in the Russian Grand Prix have never failed to score points in the Grand Prix. Six different drivers have finished on the podium at the Russian Grand Prix. Lewis Hamilton has had the most top three appearances, with four. 2014: Rosberg’s costly mistake: Lewis Hamilton started from pole for the inaugural F1 Russian Grand Prix, but it was team-mate Nico Rosberg who out-dragged him into the first corner. Unfortunately for the German, he locked-up and headed straight on, cutting the corner and forced to hand the position back to Hamilton. The lock-up caused a flat spot on his tyre, and Rosberg needed to pit as a result, leaving his race – and title hopes – in tatters. 2015: Sainz crash: Carlos Sainz suffered the largest crash of his F1 career with a huge shunt in Free Practice Three for the 2015 Russian Grand Prix. His Toro Rosso car became lodged under the tecpro barrier after the Spaniard got loose heading into Turn 14. After making contact with the wall, Sainz was powerless to stop his car heading straight into the barriers. He was taken to hospital after his extraction from the car, but suffered only a saw neck and back after the 46G impact. He was able to make the start of the race the following day! 2016: Kvyat’s home race to forget: Daniil Kvyat had a day to forget on his third appearance at his home Grand Prix. The Russian collided with the rear of Sebastian Vettel’s Ferrari twice in the opening corners, with the second contact putting a furious Vettel out of the race. To add insult to injury, team-mate Daniel Ricciardo was also caught up in the first lap drama, and recorded his worst result of the season. Kvyat was given a stop-go penalty for the incident and finished in a lowly 15th. Even worse, he lost his place at Red Bull for the next round, and swapped places with Max Verstappen at Toro Rosso. 2018: Team orders at Mercedes: The 2018 Russian Grand Prix is perhaps most memorable for Mercedes’ use of team orders. Valtteri Bottas started from pole and led throughout the early stages, staying in the net-lead for the first half of the race. After the pit-stops, Bottas remained ahead of team-mate Lewis Hamilton, but Sebastian Vettel was a threat to Hamilton. Mercedes made the call to swap their drivers’ positions and Bottas moved out of the way, ultimately allowing his team-mate to take victory as the Finn acted as a blocker to the Ferrari. The controversial decision was met with mixed reactions and lots of debate from fans.